Come join us for our Fall Friends and Family Day. 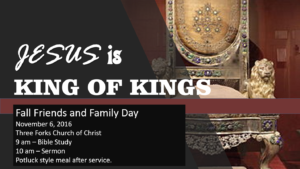 Our message will be on “Jesus is the King of kings.” This will be a message to inform and to instill hope as we remember that Jesus is truly the one who has all authroity. Bible Study starts at 9am and sevrice continues at 10. We will have a fellowship meal to fall. Everyone is invited.